The area around Piazza Navona is well known for being pretty touristy, and looking for a relaxed place to sit down for a coffee, tea or glass of wine can be a difficult task. If you’re in the know though, there are a few great places in that area to do just that – and one of my personal favourites is bar and restaurant Etablí. From the street it can be a bit difficult to know exactly what’s inside, because it’s hidden behind the thick walls and tiny windows of a 15th century building. Once you’re in however, that’s exactly what gives it its character – high ceilings with beams, alcoves and, my favourite part in the winter, a huge log fireplace. If you’re going in for a drink, coffee, or aperitivo, I’d recommend hanging around until one of the much-coveted leather sofas and armchairs are free – they’re super comfortable and the perfect place to relax with drinks or a nibble. 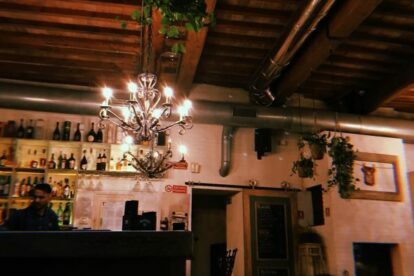 If you’re looking for breakfast, it has a great bakery & cafe area to one side – but in my opinion it’s best after dark, when the lighting makes it a really atmospheric, cosy place for dinner or late night drinks. The prices are also really reasonable for that part of town, at €5-6 euro for a glass of wine. The prices for dinner are a little higher, but still not bad for the area – and most importantly, the food is worth it!